Gehl's Foods, Inc. | AS/RS Case Study - Westfalia Technologies, Inc.
Case Study: Gehl Foods, Inc.
With their continued business success, Gehl Foods, Inc. of Germantown, WI, needed to find a way to meet their expanding order processing and warehouse storage needs within the confines of their existing 22’ high building. Gehl selected Westfalia Technologies, Inc. to design, build and install a high-density Automated Storage and Retrieval System (AS/RS) with Savanna.NET Warehouse Management Software (WMS) in the company’s 300,000 square foot warehouse. The AS/RS and WMS nearly tripled Gehl’s storage space and provides significant operational savings and labor costs, energy and more. The goal of Westfalia’s solution was to provide well over 10,000 pallet storage locations within a 315’ w. x 524’ l. x 22’ h. footprint. 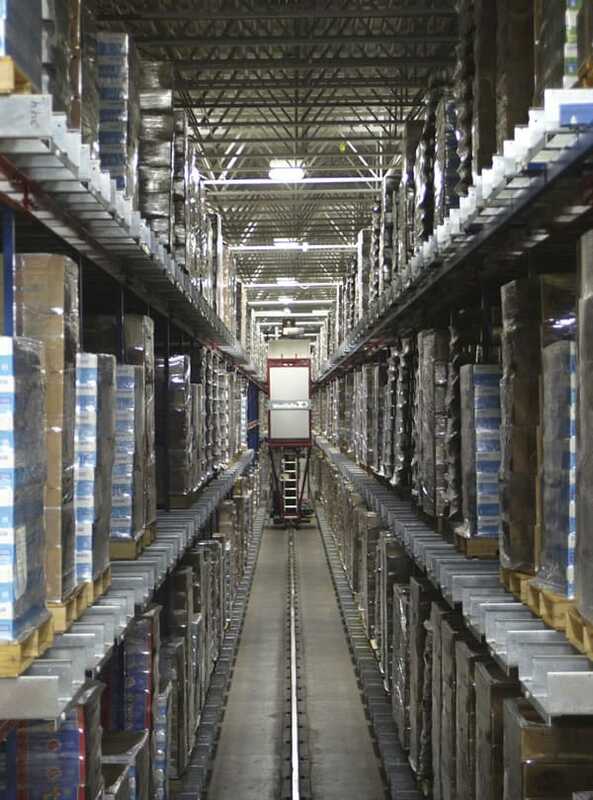 Westfalia designed a 5 aisle AS/RS with a conveying system to maximize throughput while adding significant accumulation to buffer peak shipping and receiving volumes. The multi-aisle AS/RS design is based on Westfalia’s multiple deep Satellite® technology, which provides the ability to create a compact, 6- to 11-pallet deep storage solution. Storing pallets 3 levels in the 22’ high facility maximizes storage density, thereby negating the need for a new building and possible construction costs. Included in the AS/RS are conveyors, 6 Storage/Retrieval Machines (S/RMs) with Satellite® rack entry vehicles, and WMS interfaces. Westfalia’s fourth generation S/RM design provides faster operation and longer life. Due to its sophisticated double mast structural design, it is one of the heaviest-duty SRM’s available today. As usual with Westfalia’s AS/RS, the system offers triple rail support of pallets throughout, so that various types of pallets can be used without the need for slave pallets. 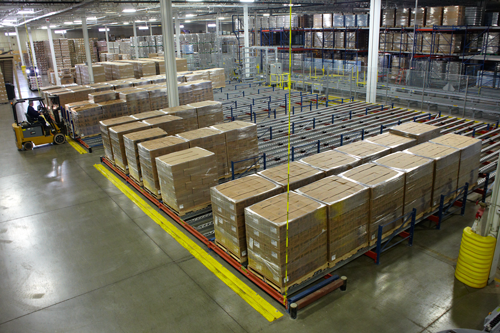 Triple rail support addresses the issue of pallet quality, often a concern in automated systems. 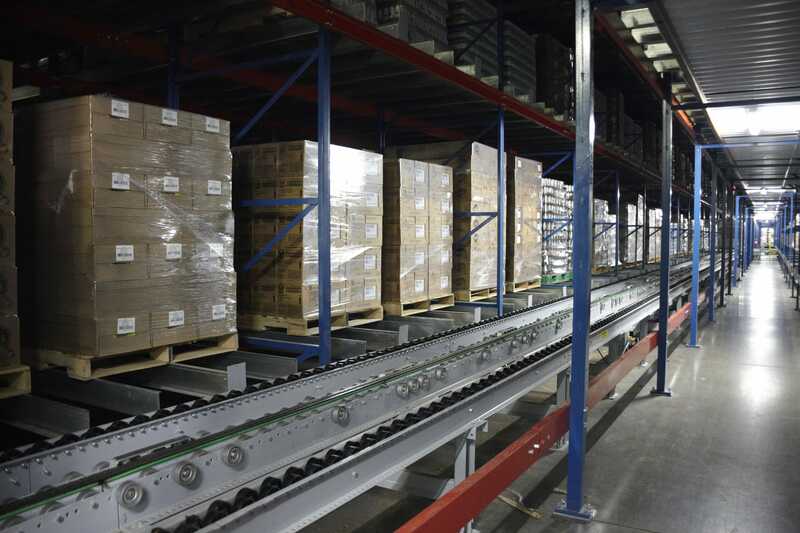 With triple rail support, pallets of all types are more balanced in their movements, eliminating product tipping and damage. Lastly, an air chain accumulation conveyor system was designed to provide access from each storage location to either end of the facility for shipping, receiving and packaging. 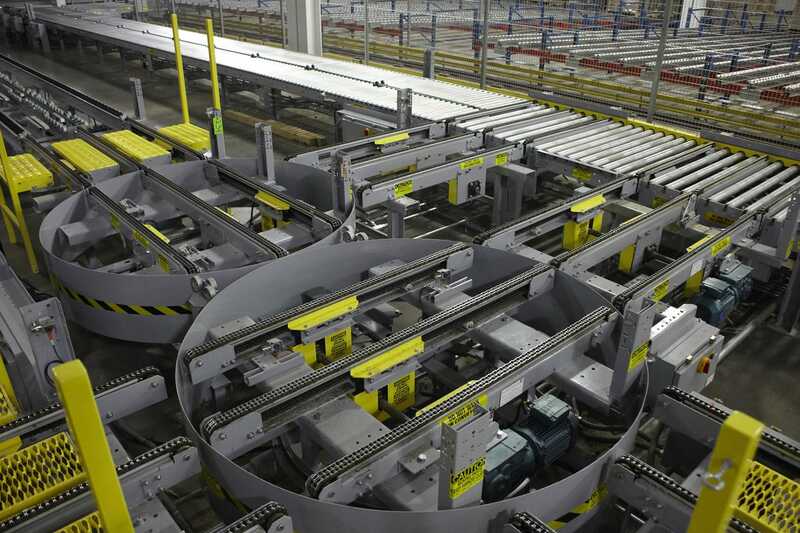 Critical to the system, pallets travel through tunnels in the racks to several packaging areas, where product may be depalletized, repalletized, and labels may be added before conveying the pallets to shipping. Westfalia’s air chain conveyors move pallets along a roller surface by means of a transport chain that raises up to engage the bottom of the pallet. The chain is raised by the inflation of an air hose, which is directly controlled by the air valve, ensuring soft start and stop. A single motor can power up to 100 feet of conveyors. Westfalia’s Savanna.NET® Warehouse Management Software (WMS) controls, tracks and optimizes all pallet movements throughout the system, streamlining flow for fast and accurate order management. Specific Savanna functionality for Gehl’s included material flow control, order management, real time reporting, logging and an interface to their existing ERP system. As much as is possible, Savanna optimizes the movements of the S/RMs to perform dual command cycles. Dual command cycles are when the SRM stores one pallet, and on the way back to the induction area, picks up another for retrieval and places it at the outfeed area. Savanna controls both the flows in and out of the packaging areas, as well as to the order staging area. Order ready pallets are conveyed to one of 16 pallet flow staging lanes which line up directly with a truck door. Westfalia’s high density AS/RS permits Gehls to grow their business while avoiding costly and disruptive off-site warehousing solutions. In their landlocked, 22’ high existing facility, the AS/RS not only increases storage and distribution capacity, but allows for the expanded manufacturing capacity too. 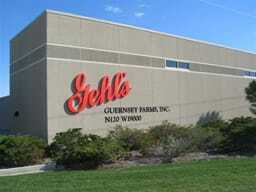 By automating their existing warehouse, Gehl Foods is enabling their business to grow into the future. Nearly 300% increase in storage capacity in the same building footprint with 3 level high density AS/RS versus previous floor stack configuration. Increased overall plant throughput and shipping capacity while reducing operating costs. Savanna.NET WMS control provides better visibility to inventory and orders, resulting in more efficient order fulfillment which greatly reduces shipping errors, as well as product damage. Handles current storage needs, and leaves more space to accommodate projected growth.